My writing is a continous essay to articulate a post-representational dynamic in theatre. I am interested in establishing a performative mechanism that redefines the dichotomic relation between philosophy and art, especially between conceptual thinking and artistic practice. Usually, I start by definying a territory for artistic exploration, supported by the documentation of specific philosophical concepts. Then there is a personal investment, that may include the exploration of my own biography and context, or a group methodology, that will than generate a collectively devised project. I like words and their materiality, and I feel rather close to an explorative writing process than to using pre-existing structures and forms as transporters of subjective perspectives. After all, some things become conceivable only by writing. And you see, this, for me, opens a space that wouldn’t otherwise exist. 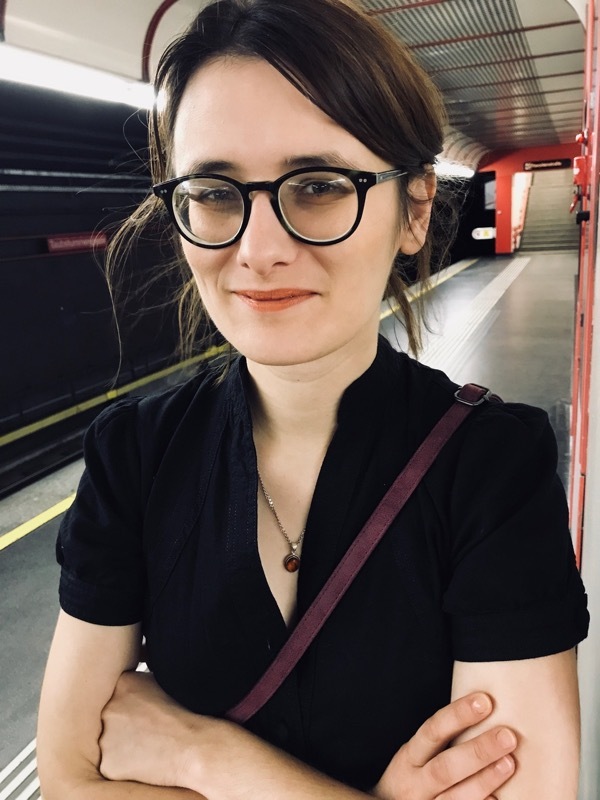 Alexandra Pâzgu (Born 1985, Sibiu) is an author, dramaturgy theoretician and practitioner interested in structures and concepts that are emerging in collective creation and site specific projects. Her focus is on the question: what new narratives for the contemporary world/stage?! Her texts share a poetical feature as an alternative to the realist-documentated interpretation of society. She writes in Romanian, German, English and French. In the last ten years she has been working in international projects in Romania, Belgium, The Netherlands, France, Austria, Luxembourg and Germany. Most of her texts so far, offer a trans-poetical and philosophical perspective of the life in European cities, with a special focus on post-representational narration and sensation. Besides her artistic practice she is interested in the organisation and the creation of intercultural spaces for dialog and the contemporary text creation. She also works as an artist theoretician and an university collaborator for different institutions (e.g. The Institute for Applied Theatre Studies in Giessen), holds lectures and workshops on the theme of contemporary dramaturgy and is a dramaturgical coach (the Academy of Performing Arts in Bratislava). In 2014 she organizes the first workshop for theatre critics in the frame of the International Theatre Festival in Sibiu. In between 2009-2014 she holds seminars on Drama Theory and Dramaturgy at the “Lucian Blaga” University in Sibiu. Since Sept.2016 she is an author of the WWWriters Room organized by the Wiener Wortstaetten in Vienna; a presentation of the 10 months project “I lost my job and…” follows at the Schauspielhaus Wien. Since Nov.2017 she is part of the jury of the SCENOfest festival in Sibiu, a festival that supports the creation of new scenic texts by young and very young authors. In 2017/2018 she will graduate from a cotutelle PhD with the title Dramaturgy as Thinking, A Deleuzian Approach to Contemporary Theatre, from the Theatre and Television Faculty in Cluj- Napoca, and the Institute of Applied Theatre Studies in Giessen. In 2014 she is awarded the DAAD scholarship for young scholars, which enables her to spend a ten month research period at the Institut für Angewandte Theaterwissenschaft, Giessen. Since 2014 she has visited the courses of the philosophy faculty at the University of Vienna, and been engaged with the notions of philosophy as artistic research, the artist philosopher and applied thinking. She graduated with honors from the MA in Dramatic Writing from the Arts University in Tg. Mureş. She gained her Bachelor diploma in Theater Studies at the Lucian Blaga University in Sibiu and studied collective creation at the Hope University in Liverpool in the frame of an Erasmus scholarship. Dramaturgy residencies and collective projects: She participates in the first ever dramatic residency organized in Romania by “Reactor de Creație și Experiment” in Cluj Napoca. She writes “Fluorescent Proteins”, an essay and an urban research of the city. The staging took place on 14.11.2016, directed by Leta Popescu at Reactor in Cluj Napoca. In August 2016 she is a guest writer at the „Villeneuve Chartreuse“ in Avignon, in a collective residency on the theme of the event and how to rethink the contemporary reality? In Nov. 2017 she is a resident of the national theatre in Tg. Mureș where she writes on the theme of fears for the actors of the theatre. „Supernove“ premiered on 15.02.2017 directed by Radu Nica. 2014: „Why don’t we do it on the streets “(dir. Neil LaBute, Teatrul Act, București); 2012: „Cities on Stage“ (dir. Armel Roussel, Théâtre National, Bruxelles and Teatrul Național “Radu Stanca”, Sibiu); 2011: „În aer“ (dir. Chris Nedeea, Teatrul Național Timișoara); 2011: „The H(eden) Garden“ (dir. Medeea Iancu, UAT Tg. Mureș). Prizes: Her play “In the Air” has been rewarded “Play of the year” in 2011 and her play “The H(eden) Garden” won “The best collective production”, and “The best spectacle” at the Young Actor’s Gala, in Mangalia, 2011. She also received a nomination for the “Irish Embassy Award” in 2011. In 2012-2013: “European Prize for Cultural Management”, Donauschwebische Kulturstiftung. “Supernovae” is a devised theatre project that re-considers the meeting between the dramatic author, the director, the actors, the composer and the stage designer. The intention was to create a map of the citadel fears, starting from our own subjective experiences, memories and perception. What kind of attitude do we develop when faced with the unavoidable, how to live with fear, is there something beyond fear? Without trying to give an exhaustive list of all the possible human fears, the text proposes a poetic-philosophical research, a playful documentation and a political investigation of the real, and analysis the structures that consolidate and support the fear. How does our imaginary feed the fear, and what are our own representations of how fear appears in our everyday lives? The text is to be regarded as a working in process stage proposal, a performative essay with the focus on the city, the youth living in the city, and the meeting between the urban structures and the human ones, in Romania. The text was written during a month residency and it relies on the documentation of the city of Cluj. It reflects my interest on practicing dramaturgy as thinking, and of thinking the world via writing, in a performative register. What lies beyond the critique of the system and that defines us as individuals? How may I understand the world not as a subject, but as part of a system whose logic I do not get to decide? Today, the world may not be ordered just from the perspective of the thinking subject. How may we still write and say stories today without characters, a conflict or dialog? This project proposes a different way of constructing narrations in theatre, one that wishes to question the framed, institutionalized image that we have upon the world and that is usually referred to in theatre. Following examples and notions drawing from Deleuzian thought, this text is an essay of rethinking the relation the individual has to art and reality, and go further beyond the logic of the thinking and acting subject. Come and see the show to see what the author wanted to say! The text was written during the DRAMA 5 Residency, the first residency for dramatic writing in Romania, organized by “Reactor de Creație și Experiment” in Cluj-Napoca, July 2016 and financed by AFCN. The premiere of the show took place on 30th October 2016, was directed by Leta Popescu at “Reactor de Creație și Experiment”, Cluj-Napoca.